When Emily remarked she was "getting tired of eating out" after our multiple culinary forays during the Chinese Restaurant Awards and Poutine Challenge, I remained skeptical. Tired of eating? Yah right... But after a Friday night league game, I was beginning to realize what she meant. It was if I was suffering from eating fatigue. A 2-month stretch of non-stop eating (sometimes up to 4 dinners a night) was beating me down. 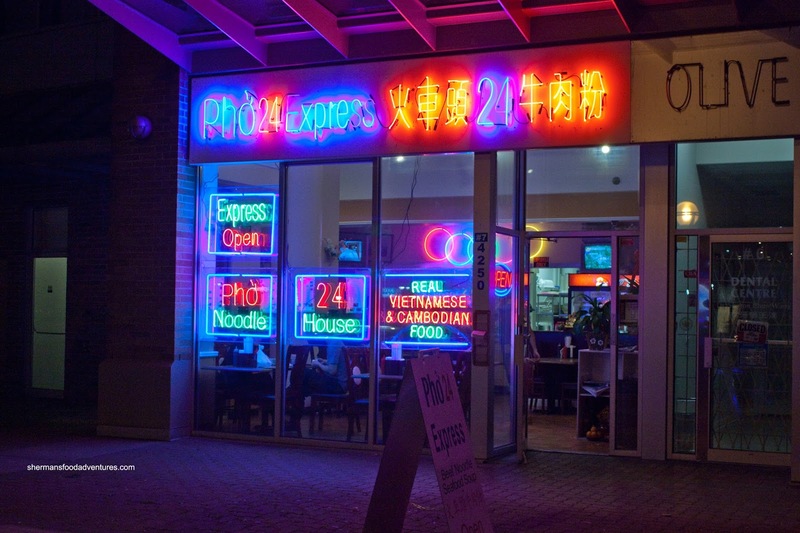 Yes, #firstworldproblems Hence, Milhouse and I went for something lighter at Pho 24 Express. 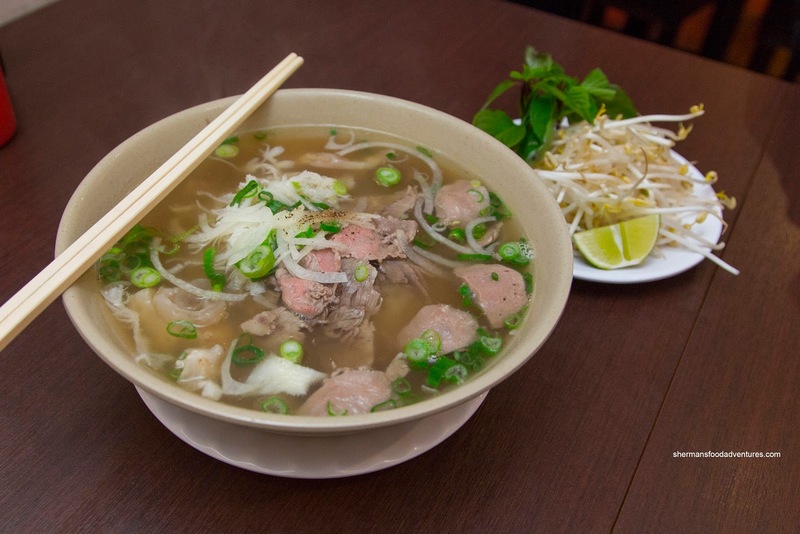 As for the aforementioned Pho, we had the Pho Dac Biet in the extra-large size. Unlike the version at Pho Extreme Xe Lua, this one actually consisted of more noodles and meat rather than just broth. We found the broth to be clean yet rather light tasting. It was mildly sweet, but not much in the way of meatiness. Noodles were chewy while the meats were decently tender. 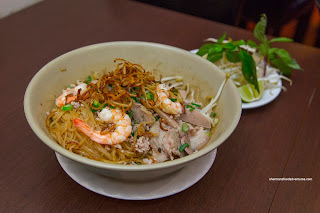 We also shared the Phnom Penh Dry Noodles which were pretty average. It was nowhere as good as the versions found at Phnom Penh and Pho Tan. The noodles were pretty clumpy without the aid of enough "sauce". That also meant there was a lack of flavour and impact. On the other hand, there was enough supporting ingredients to keep things interesting. 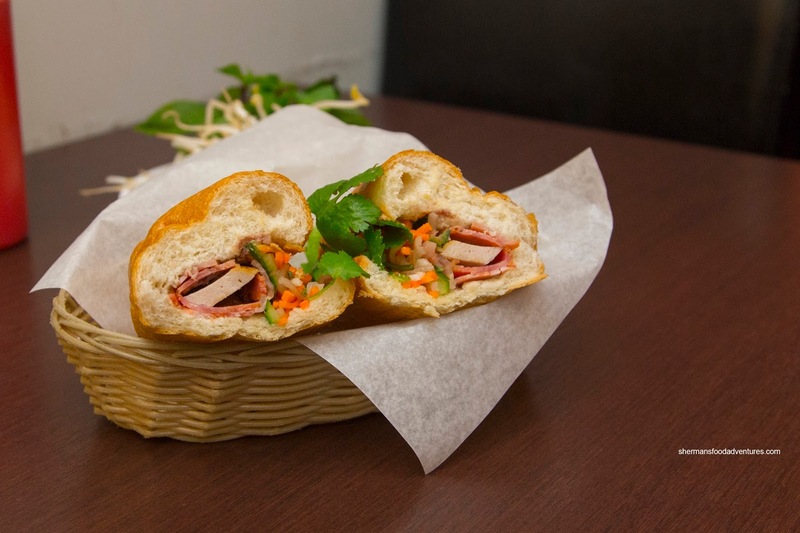 For good measure, we added the Banh Mi Dac Biet. It featured light and airy bread that was toasted up until crusty. There wasn't exactly a boatload of cold cuts nor pickled veggies, but the sandwich ate pleasantly nonetheless. With that being said, the overall flavours were rather mild due to the lack of ingredients. On the flip-side, this was still pretty decent considering the place doesn't specialize in banh mi. 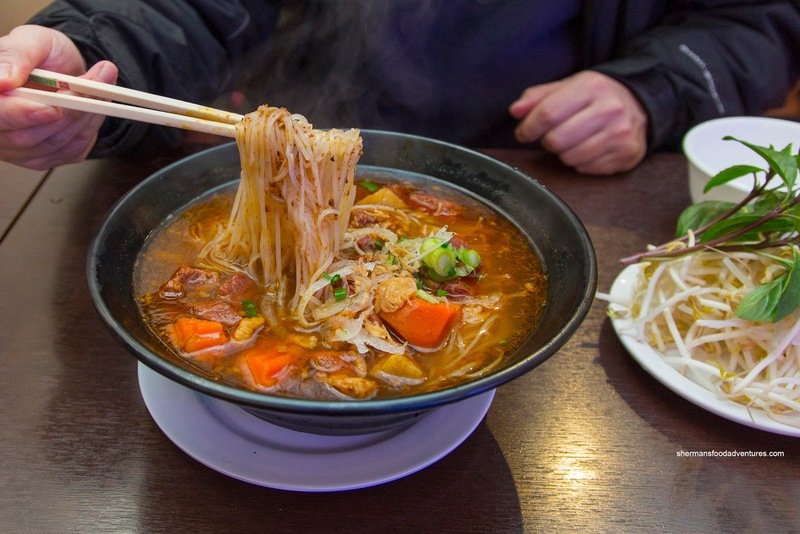 Suffering from the same eating fatigue symptoms, we returned the following week for a bowl of Bo Kho Noodles. Also in extra-large form, the soup base was aromatic, yet weak at the same time. There was the sweetness of carrots and a certain meatiness, but it lack depth-of-flavour. Furthermore, the little cubes of beef were dry and somewhat chewy. 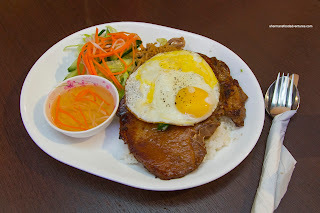 Changing things up, we got the Lemongrass Pork Chop, Chicken and Shredded Pork Broken Rice with Fried Egg. Sure, the pork chop was on the drier side, but it was not particularly chewy. However, it lacked char much like the chicken. They were well-marinated though with obvious lemongrass hits. I enjoyed the chewy broken rice underneath as it didn't soften too much from the egg yolk. 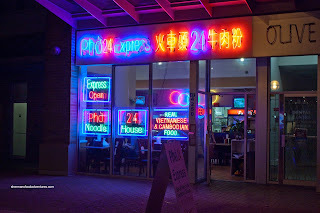 So as much as the food at Pho 24 Express is not the best I've had, it is definitely serviceable especially for late night.